I track my net worth monthly on NetworthIQ. At the end of December 2009 our Net Worth is $616,854 which is down $15,161 from last month. Almost all of that drop is due to decreased real estate values. Our home and rental properties both dropped around 2-3% in the month. Otherwise our cash is down a bit due to holiday spending as well as some continued rental expenses. Yesterday I stated my opinion that if you can't cut A/B grades in high school that you probably shouldn't go to a 4 year college. But what should you do if you don't have very good grades in school? Below I've listed a variety of career choices that might be good areas to go into. Most have wages around $40k average. These are just some semi-random suggestions. Its really up to you to decide what to do with your life. If you don't know what career you should pursue then I'd recommend going to your library or counseling office / career center at school and getting all the books or material you can about career choices. Figure out your strengths and match that to a job that you think you might like and you can make a living at. Real Estate agent - Median wages are about $40k. You have to pass certification training and you have to be competent at selling. Income can be very inconsistent and you may have little or no guaranteed salary. Hours may vary significantly. Military - Joining the United States Military is a pretty good career option for a number of reasons. Members of the military provide an invaluable service to our nation. The pay is not fabulous starting out but there is good potential for promotion and plenty of benefits. There is the obvious danger related to the job. Another big benefit of the military is that it can give you the experience to open the door to many civilian jobs. Skilled Construction : Electrician, Plumber, Sheet Metal worker, etc - Skilled workers in construction can make very good wages and can have good benefits. Electricians and plumbers both make abut $22 /hr average. Union positions generally have higher wage levels and benefits. Formal apprentice programs will give on the job training as you are paid to learn. This work can be dangerous and may be outside in harsh weather. Construction work is also very dependent on economic cycles. Car Salesman : A job in retail sales generally won't require a degree. If you have an aptitude for sales then you might do well as a car salesman. The median hourly wage for auto sales is over $18/hr. Your wages will depend greatly on your ability to sell. If you feel you have a knack for sales then you could try it short term and you'll know if you can succeed at it or not pretty quick (cause they'll probably fire you if you can't). Work up to Management - This isn't a job you can instantly jump into but a career path that can lead to a highly compensated position. Most service industry employers have career paths to promote people form entry level positions to management roles. Air Traffic Controller - This is a hard job to get into and there are not many openings. If you don't go to special school or get training in the military then you have to be 30 years old and have some work experience. The work difficult and is extremely stressful. But if you can cut it then the compensation is good with average wages well over $100k. Postal mail carrier - Median wages are over $49k. Benefits are pretty good. You have to score well on the postal exam and jobs are going to be harder to come by. Competition for postal carrier jobs is going to be keen in coming years. You have to work outside and early hours. Auto Mechanics - There are a lot of cars out there and they eventually break down so there are a lot of opportunities to work as an auto mechanic. Median pay is a bit over $16/hr. Training varies but usually includes some form of vocational post secondary certification. You may go to a community college for an associates degree. Many auto makers and dealers sponsor programs to train mechanics in work and study rotations. Paralegals and legal assistants - Most paralegals have a 2 year degree but some are trained on the job. Paralegals make $46k median wages. The work is indoors but might have long hours and stressful environments. Demand for paralegals is growing. Hazardous material removal - This is the kind of job where you suit up and wear a mask to remove asbestos or other hazardous materials. There is no special education required but you might need certification. Wages are pretty good with median pay just short of $18/hr. Of course you run the risk of exposure to the hazardous materials but if done properly it should be fairly safe. Dental assistants - You generally learn this field on the job. This is not to be confused with a dental hygienist which is a higher level occupation. The dental assistant is there to be an assistant by performing various duties in the dental office. Median pay is about $32k and job prospects are good. Correctional officers - Guards make about $38k median wages. Some positions may require a college degree and others may not, so you may have to look around. I'm not really sure how dangerous these jobs are exactly but truck drivers and farmers die on the job more often than police officers so don't assume too much about the risk factors. Spam or other obvious advertisements are not allowed. Solicitation for business ventures or advertising agreements are not allowed. Abusive or offensive language towards anyone (including myself) is not allowed. Religious or political argument in comments is not allowed. Links to offensive sites in comments are not allowed. If any comment violates this policy than I reserve the right to remove it without notice. With a $6500 cash back incentive you could get some pretty cheap new cars. The Pontiac G3 is $14,335 MSRP so $6,500 off that would make it $7,835 for a new compact car which is pretty hard to beat. GM will continue to support both brands so your warranty will be valid and they'll sell parts for the cars in the future. But it seems to me like there might be a catch somewhere. I get the cheapest cars like the G3's have sold quickly to bargain hunters and with Pontiac and Saturn both being shut down there might only be a few cars left on lots. If you're in the market for a new car then it might be worth a look though. If you can't get A's or B's average grades in high school then I don't think you should go to a 4 year college. Note that I said A/B average grades. So if you get an occasional C or D then that shouldn't alone hold you back as long as you're averaging B's or better. I'm also applying this to a 4 year college. If you don't have the best grades then you might still consider starting at a community college or junior college either as a stepping stone to a 4 year school or to pursue a 2 year degree. Why do I draw the line at a B average or better? Simply put I think that if you can't pull at least a B average in high school then you aren't going to be prepared to succeed in college. High school is easier than college and if you can't succeed academically in high school then you can't succeed academically in college. Going to college and struggling then dropping out won't really benefit you. Or if you go to college and work really hard and barely manage to get C's in college then it will be fairly hard to find good employment with such a transcript. Generally I think people in this situation are better off pursuing another career that wouldn't require a 4 year degree. Why shouldn't people go? College is expensive and it has to provide a good return on your money to be worth the investment. If you can't succeed in college then it is wasted money. Too many people go to college nowadays and they are wasting a lot of money by doing so. Only 60% of people who go to college graduate within 6 years, so 40% of people are wasting money going to college. So what if you don't have the best grades in school, then what should you do for a job? Tomorrow I'll list some career choices that don't require a 4 year degree. Around a year and a half ago I talked about how we were Spending a lot on eating out. Originally we were spending around $900 a month on eating out. Since then we worked to cut back the spending some and recent spending has been in the $600-$700 range but thats still a lot. Eating out has been one of our major expenses. Some of you might be wondering how I could possibly "waste" so much on eating out. I splurge a significant amount on eating out because I value it highly and I can afford it. I don't have a new car, I live in a modest sized home and I save over 30% of my income. If I made less money, or if I had lower savings or any debts then I certainly wouldn't be eating out as much as I do. Still eating out is a significant expense and I've tried to keep the spending on it down. My wife and I discussed it lately and we agreed to cut back on our eating out. We usually eat out about four times a week and we decided to cut back to three times. This should cut our costs for eating out roughly 25%. This should get us down to the $450-$525 / month level. We decided to cut back eating out for a couple reasons. We both felt that we were eating out a lot and that we wouldn't really miss the experience if we ate out a bit less. I enjoy eating out. The experience is something I like to do. But if I ate every meal out or ate most meals out then the experience would be so routine that it would end up meaning nothing for me. Another reason we decided to cut back is that we felt we had higher priorities for the money. Eating out once a week less will save us something around $2,000 a year in after tax money. There are a lot of great things we could do with an extra $2,000 a year. We haven't designated a specific thing to do with that money and in fact we may just save it. But when we thought about it we asked ourselves the question : would we prefer to eat out 1 time a week more or would we prefer to have $2,000 extra per year? We chose to have the extra money. Why not just eat at cheaper places? If you're quick with math you can probably figure out that we spend around $35-$40 per meal on average. Those are not cheap meals at cheap restaurants. Instead of cutting back to 3 meals out we could just eat 4 meals at cheaper restaurants. In fact I could actually afford to eat a lot more if we ate at junk food places all the time. A primary reason we eat out is for the entertainment value. I like to sit in a nice comfortable booth in a nice restaurant and have a nice night out with my wife. I don't like to pull through a drive through and have someone hand me a bag of warmed over food like substances. I don't really want to trade good quality food for low quality food. Lets face it junk food places don't sell very high quality food. Now I don't mean to come off snobbish about junk food, I like McDonalds as much as the next guy. But eating a quick burger isn't the reason we spend money on eating out. We eat out for the "going out" entertainment factor and the higher quality food. Now that Christmas is past us its a good time to go buy some Christmas stuff. If you need any wrapping paper, Christmas decorations or holiday cards you're sure to find them for bargain prices this week. I would assume most stores are running sales to clear out their holiday stuff. Target.com has a sale on their holiday items. Seems their discounts are in the 30-75% range. HomeDepot also has a clearance sale and they are selling a bunch of stuff for 50% off. Those are just the first two websites I randomly chose to check out. If you're going to shop online then try using Ebates and get a further discount. Ebates has 5% back for Target and 3% back for HomeDepot. Course like I said those are just two randomly selected stores and I'm pretty sure most other stores will have holiday stuff on sale. I will be taking a break from posting this week for the holiday. I don't expect to post anything through Christmas but should return with regular posts sometime after Christmas. We got some bad news yesterday. The furnace in one of our rentals has broken down again. This is the second that furnace has broke in the past few weeks. The first repair was fairly minor and was only around $150 to get done. However this time the repair would cost us around $400. We had the same furnace break down last winter as well and I can't remember how much it cost to get fixed that time. The furnace is fairly old now at least 15 years and is likely to keep failing at this point. Rather than keep pumping money into repairing it we decided instead to get the entire furnace replaced. Repairing the furnace is about $2000. So we could spend $400 today on a repair or spend $2000 to replace it. Thats really a $1600 difference to get an all new furnace and not have the risk of more repair calls next month or next week. This is a good reminder that if you want to own rental properties that you really need to have some working capital. If we didn't have $2,000 readily available to spend and we were on a tight budget then we'd end up just paying the $400 to repair the furnace. I see that as a short term solution that would end up costing more in the long run. You don't want to keep pumping money into repairing an old item. I had previously posted an article saying that New York Life Whole Life Policy Ad Overstating Returns. After a comment from a representative of New York Life they correct a mistaken assumption that I had made. I originally thought they had overstated their returns by not counting the annual premiums in their calculations, but they had in fact added in the premium costs so I was incorrect. SO I've edited that article to state that I am retracting it and I put the word "NOT" into the title. In this case I was wrong so I've corrected it. How Much Does the Electricity to run Christmas Lights Cost? Last year I talked about some ways that you can save on electricity costs on your Christmas Lights. This year I decided to measure and find out exactly how much electricity my own Christmas lights use. 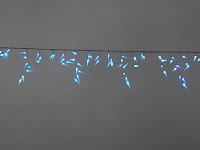 I've got a simple string of the icicle style Christmas lights up decorating our house right now. I've had them setup on a Kill-a-Watt meter to see how much electricity they use. The lights are setup to turn on and off with a mechanical timer. The string is using 72 W of power. The meter is showing 8.07 kWh of total usage. The meters timer shows its been running for 387 hours total which is 16 days and 3 hours. I have a timer setup to turn the lights on sometime around 5pm and then shut them down around 11pm (give or take). The lights are on about 6-7 hours a day. Its a mechanical style of timer so the times aren't super exact. So in about 16 days I've used a hair over 8 kWh of power. That works out to 0.5 kWh per day of operation. My electricity is about 10¢ per kWh. 1 day of operation costs 5¢ in electricity. The whole Christmas season will cost me around $1.50. There are several restaurants out there that offer a "Buy $25 Get $5" deal. By this I mean that if you buy a $25 gift card from them that they will give you a free $5 coupon or gift card. A trick to use with these offers is to buy a card for yourself at a restaurant you know you go to and get yourself $5 off by doing so. Buffalo Wild Wings : From the Buffalo Wild Wings homepage click on the 'tip yourself' promo. But you can't get their deal online and you have to go into the store. Buy before 12/31. Red Lobster : You can get Red Lobster gift cards online. Use promo code FCC5425 and buy before 12/21. If you buy a $25 gift card then you get a coupon worth $5 off of 2 entrees. Red Robin : Get $5 in 'bonus bucks' for every $25 you spend. Denny's : For the deal from Denny's they have a $1.95 s/h fee so I'd recommend you go to a store to buy in person. If you're buying online then make sure theres no shipping or handling fees. I didn't see any on the Red Lobster or Red Robin sites but they might sneak in a fee when you check out. Is High Yield Stock a Bargain or a Warning Sign? What do GM and Citigroup have in common? They are both components of the Dow Jones Industrial Average, they both paid dividends of over 4% in 2008 and they both lost 90% of their value since Jan. 2008. So lets say you were shopping for stocks in early 2008 and you figured that Dow stocks should be a safe bet. You might filter the Dow for undervalued stocks by looking at the higher yielding stocks. These stocks might have seemed like a relatively safe bargain a couple years ago but both turned out to be flops. If a stock price drops then the yield % goes up. So a Dow component with a high yield might be viewed as a good value. On the other hand a high yield may be a reflection of a stock who's price has been declining yet still has a relatively high trailing dividend. A stock in trouble may be destined for bankruptcy or it may be due for a cut in dividends. A high dividend yield may be fools gold. The bottom line is that a high dividend on a stock isn't alone an indication that the stock is a good value. High dividends could be reflection of a stock that is in trouble. You should take caution when picking high dividend stocks to make sure they have sound financials. The Unofficial Guide to Real Estate Investing is a very comprehensive introduction to investing in real estate. The book covers everything from valuing properties, buying and financing, tax implications and 1031 exchanges all the way through being a landlord. The Insider's Guide to Buying a New or Used Car is a complete guide to buying either a used or new car. They discuss topics such as : researching cars, getting loans, doing a trade in, test drives, figuring dealer costs, buying tactics, countering the dealers sales pitch, and good and bad negotiating tactics. There are a lot of good tips on negotiating sales and I think that's the section I got the most out of. Investing for Dummies by Eric Tyson. Reading a Dummies book doesn't mean you're literally a dummy. Topics include overview of different types of investments, discussion of risks and rewards, stocks, bonds, mutual funds, real estate and small businesses. The book does a good job of pointing out things to avoid and giving tips on various topics. The Complete Idiot's Guide to Getting Rich is focused on obtaining and growing wealth. Don't let the title throw you, its not a get rich quick scheme. The book covers all the phases of wealth building and I particularly like their 5 stages of wealth. The Millionaire Next Door is mostly statistics on millionaires. I found it a very interesting read but honestly it doesn't have too much along the lines of advice or plans to help you. The book does a great job of laying out the case for how people who live below their means have the best shot at wealth. Jim at Bargaineering recommends that you Don’t Buy A Home Within 5 Years of Graduation and I think that is pretty good advice. How do you pick a good mutual fund? The performance track record and investment philosophy of a mutual fund and its manager seem like good way to pick a mutual fund. If a fund has been consistently performing for years and their fund manager has a good head on their shoulders then it seems like it should be a good investment. That is the logic that lead me to buy into Brandywine Blue (BLUEX) a couple years ago in my 401k. They'd been averaging about 13% returns for 20 years and were in the top 10% of funds. They invested with long term value in mind and scrutinized the financials of companies. They purposely avoided Enron because they "couldn't get their hands around" the company's books. Both their performance and philosophy seemed good to me. Whats not to like about them? It didn't take me too long to find out the answer. Jump forward a couple years... their 1, 3 and 5 year performance is at the bottom 30% in their class. Their YTD performance is 16% below the index and they are dead last among funds in their class. I still don't know if theres anything "wrong" with their investment strategy per se or if something has changed. I really don't know why they are down so far right now. But the fact remains that what was a very attractive looking fund a couple years ago is now a dog. Consider the fund CGM Focus (CGMFX) which I was looking at in summer of 2008. At that point they were averaging 35% gains for 5 years. They were up a whooping 79% in 2007. But so far in 2009 they've underperformed the S&P 500 by 16% and they're 23% behind the fund category and the year to date returns place them in the bottom 2% of funds in their category. So again we find a mutual fund with fabulous returns for the past few years which then fails to perform after that. Now these are just 2 semi-random examples. You could also find a mutual fund that performed great for several years and has continued to do so through the recession. But how do you know if any one fund with a good recent performance history will continue to perform well in the future? You simply can't know. You've probably heard it before: Past performance is no guarantee of future results. Brandywine Blue and CGM Focus are two good examples of this fact. State Farm says that over 250,000 families have damage from frozen or burst pipes every year. The costs of a frozen pipe can be pretty significant. First you may have to call a plumber to unthaw frozen pipes and/or repair broken pipes. A plumber visit will run you at least $100 you can assume. Worse yet frozen pipes may burst resulting in water damage to your home and belongings. Water damage could be very costly running you hundreds or even thousands of dollars to fix. It is a serious enough problem that State Farm is concerned with it undoubtedly due to the amount of money they have to pay due to claims from their customers. Frozen pipes are generally preventable so don't let it happen to you. Now is the time of year you should make sure that your homes water pipes are protected against freezing. Don't shut off your heat completely if going on vacation. Insulate pipes that are exposed to outside walls or in an unheated basement or crawl space. State Farm's frozen pipe page. I am retracting this article. I was incorrect in my conclusion when I wrote this article originally. I originally stated that New York Life had overstated the returns on their whole life policy in an ad in Businessweek magazine. However I had mistakenly assumed that their annual policy costs were on top of the initial investment when in fact the annual premium costs were included in their calculations. The return of 3.9% stated in NY Life's ad does appear to be correct and I was wrong to declare they overstated it. The original article as written is below. In a recent copy of Businessweek magazine there is an ad from New York Life where they compare the average annual return on their $50,000 whole life policy and the S & P 500. They have a little bar chart they made up with the growth of their insurance on the left and the S&P 500 growth on the right. They are looking at 9/30/99 to 9/30/09. The graph shows that their insurance went from initial value of $15,000 to a cash value of $22,005 where as in the same 10 year period the S&P lost money dropping to $14,778. They say their insurance grew at a 3.91% rate and the S&P 500 is down -0.15%. That all sounds fine but the problem is in the small print. At the end of the ad they have a paragraph full of detail and other info. They say that the policy is "purchased in1999 for a 35-year old, non smoking male; $648 annual premium plus $14,352 lump sum payment for paid up additional insurance" So its not a $15,000 investment it is instead $648 per year plus $14,352. Thats a total of $20,832 that you've put in. They claimed that 3.91% growth from $15,000 turning into $22,005. But you've paid more than $15,000. The total amount of money you've put in is $20,832. If you look at an investment of $20,832 growing to $22,005 in 10 years then thats a growth of 0.54%. [ This was an incorrect conclusion on my part, the 3.9% rate that NY Life advertised is actually right.] But to be fair you are getting $50,000 of insurance coverage at the same time. However to ignore that $648 you're spending a year is not realistic. Whole life policy premiums are very expensive. You can buy term life for much less. I did a quick quote on a $50,000 term policy on QuickQuote and there I found a 20 year term policy for $97.50 per year. So if you're paying $648 a year then thats about $550 more per year for the whole life policy. Whats the annual return on $14,352 lump sum and $550 a year if you end with $22,005? That works out to a 1.25% return. So compared to buying term life the real return for the whole life is 1.25% annually. Thats not horrible. Bottom line that NY Life whole life policy return is much closer to what you might get in a basic savings account over the past 10 years. If you'd bought a term life policy and put your money in treasuries then you'd be ahead. True the NY Life policy has beaten the S&P 500 in the past 10 years, but then that hasn't been hard to do. The past 10 years has been one of the worst 10 year stretches for the S&P500. You could have beaten the S&P 500 in several ways. If you go back just a couple years the S&P500 was trading about 50% more than it is today. Was NY Life bragging about the returns of their whole life policy compared to the S&P 500 then? No because the S&P 500 was beating their insurance policy by a pretty good margin at that point. It seems like the NY Life policy isn't a bad return for a whole life policy but I do think their ad is a little bit misleading. I have yet to find a cash value life insurance policy that was a better value than simply buying term insurance and investing the difference. After we got our home air sealed and added insulation back in August I've been trying to figure out exactly how much it is saving us on our heat bills. I just got the November electric bill so now I can see what we're saving 21% in November this year. Previously I discussed the heat savings we saw in October. If we assume other non-heat electricity use of $80 a month then that is a 52% drop in our heat costs for October. The electric bill for November 2009 was $187.37 which is $28.91 lower than last year. That represents a 21% savings in our heating costs for November this year compared to last year. Now lets compare how cold it was this November compared to last year. I use WeatherUnderground to find the average daily temperatures and then calculated the degree days myself. Average temperatures were about 3F degrees colder at 49F in 2008 and 46F in 2009. So November 2009 was significantly colder than Nov. 2008. I'm also working under the assumption that other electric usage through the month didn't vary significantly from 2008 to 2009. If you look at October and November combined we've saved $64.44 total so far this year compared to last year. That represents about a 31% savings on our heat costs so far. Basic frugal living can save a substantial amount of money in the long run. I do a lot of pretty simple frugal things in my life that add up to make a sizable financial impact. Below I give some examples of how savings from basic frugal living can add up for you. I bag my lunch 4 days a week. It costs roughly $2.50 to make a lunch compared to about $6 to eat out. I could have a cheaper bagged lunch but I like higher quality lunch. I actually enjoy mowing my own lawn. Its good exercise and a good excuse to do something useful outside. I almost always wash my own car. I don't wash it very frequently to be honest and I'm just ballparking a rough guess on how often I do it. I might spend a half hour hunting through the racks and end up with 1 maybe 2 good items. Lets say I average 30 minutes per item and I pick up 8 items a year. I spend about $5 per item and would probably spend $20-30 for them new so figure a $20 average savings. Altogether I spend 18.84 hours doing these tasks. Thats not much time really. On average its less than 30 minutes a week. In total I save $1,535 per year. That works out to $81/hr savings in after tax dollars. Thats a pretty good use of time don't you think?? Now what is the impact of this over the long run? If I started this at age 24 and I do theses things for 40 years and invest all that money and get 10% annual returns, if inflation is about 3% annually then at the end I'll have just under $900,000 after 40 years! Of course I'd have to adjust that for inflation as well so it would be equivalent to about $280,000 in todays dollars. Some notes: The math here is meant to be realistic and drawn from my own life, but these are 'off the top of my head' numbers meant for example sake. I don't know if its really realistic to assume 10% growth on the investments and 3% inflation rates, but I had to pick numbers. For reference, if you assume 8% growth then you'd end up with over $550,000. I haven't considered the tax implications of your investments so you can assume the money is taxable. Bad Money Advice discusses the supposed high rate of bankruptcy rates among lottery winners with : Why Lotteries are Bad – The Third Reason They have the same doubts that I've had about how common bankruptcy really is among winners. Generation X Finance also points out some bad money advice with Robert Kiyosaki is Off his Rocker (Again) – Is The 401(k) Really the Biggest Scam Ever? Free Money Finance has One Example of Living Paycheck-to-Paycheck which I think is a very good tale of how bad relationships and choosing the wrong mate can really ruin your finances. Bargaineering talks about Charge Cards: The Forgotten Option Since I use an Amex credit card and pay it off monthly switching to a charge card wouldn't be much difference for me personally except unfortunately the charge cards have fairly steep fees. On an episode of the Suze Orman show the other day they had a guest on the show with some financial problems. The woman and her husband were struggling financially due to over spending and the husband only working part time. They made almost $100,000 between them but only had $300 in the bank. One detail stood out for me was the amount they had paid in bank overdraft fees. So far this year in 2009 they had already paid over $4,600 in bank overdraft fees. Yikes! I've seen stories of how banks made over $36 billion in overdraft fees last year. That is in the ballpark of $300 per household. The vast majority of the overdraft fees are paid by a minority of account holders. In 2007 the American Banking Association survey found that 80% of consumers did not pay any fees. That is a whole lot of fees paid by a whole lot of people. If you are having problems with overdraft fees then paying for your day to day expenses with cash would be one strategy. That way if you put $20 of gas in your car you won't risk running over your balance on your account and hitting an overdraft fee. Theres no overdraft fees with cash. The House voted to extend the estate tax on wealthy households. The changes passed by the House would make the $3.5M exemption permanent. If the law isn't modified then the estate tax would be repealed for 2010 and then drop back to the old $1M exemption after that. But its not law yet. It will also have to pass the Senate and get signed by the president before it is law but this is one step. It might take a while for the Senate to get around to debating the issue since they're busy with health care reform and its possible the Senate won't go for the House's version and it could get modified or die altogether. This shouldn't impact the vast majority of us. Most of us won't die with millions in the bank in any case. Ebates is advertising December "Double" cash back for the holiday shopping season. Oddly the 'double' doesn't seem to be literal since they are advertising before rate of 3% and after rate of 5% for some merchants. These are just a few of the stores that you can get rebates for from Ebates. If you're doing any online shopping then I'd recommend checking out Ebates to see if the merchant has a rebate there. My Updown account is currently up about 19% for the year so far. The S&P 500 is up around 23% for the year. Overall I'm down up 2.9% since I started. The S&P is down -14% since I started in Updown. I made a few trades in November. I bought 310 shares of the oil trust BPT at $78.76 and 280 shares of the high yield bond ETF HYG at $85.60. Both BPT and HYG are on my previously mentioned watch list. I cashed in profits by selling half my Harley stock HOG or 715 shares at $27.90. I also sold off 500 shares of MGM at $10.90. The amount of homes for sale on the market at any given time versus the amount of people buying homes is an indicator of the health of the housing market. If the supply of homes is too high then there is too much supply versus the demand and prices will negatively impact prices. On the other hand if supply is tight then we'll probably see prices go up. This is basic supply/ demand economics. The housing inventory is a measure of the amount of homes for sale on the market versus the amount of homes sold in a month. So for example of there are 5 million homes for sale and homes are selling at a rate of 1 million / month then we can say that there is 5 months of inventory. If there were 10 million homes for sale and they were selling 1 million / month then that would equal 10 months of inventory. Right now the inventory level is 7.0 months. 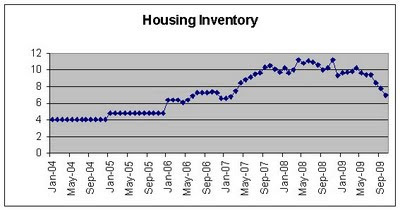 The housing inventory peaked at 11.2 a couple times in 2008 both on April again in November. You can see that back in 2004 through 2006 timeframe the amount of housing on the market was around 4-6 months. Sales of homes were pretty healthy then and the market was doing well. So if we can get back to that level of supply then I'd expect that the market would be back to a relatively healthy state. The downward trend in inventories from 2008 till now is a good sign for the housing market. 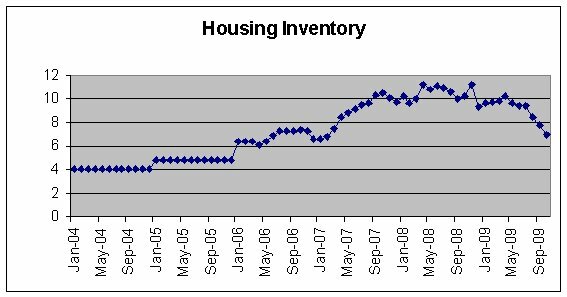 Data Sources: The data on data360.org for months of US housing inventory which had the #'s from 2004 till Oct. 2008. and individual monthly press releases from National Association of Realtors for the past 12 months. At the end of November 2009 our Net Worth is $632,015 which is up $4,673 from last month. Our net worth is up 17% from 12 months ago in Nov. 2008 when our net worth was $539,188. Nothing exciting or special went on in the past month. On the positive side: Our cash, stock and retirement were all up. Plus we paid down our mortgages some. On the down side, the value of our real estate including our primary home and our rentals dropped a bit. I got an email from Alice.com advertising 30% off on gift cards today. The offer expires at midnight central time. There is a 'catch' though to get the full 30% off you have to share their deal via Facebook. If you don't share the deal via Facebook then its 15% off. The 30% off deal is pretty good. I got a $50 gift card for $35 myself. It seems that its not an instant electronic gift though and the confirmation email I got said my order would ship in 5-7 days. Shipping was free and there aren't any obnoxious processing fees, so its a straight $35 cost for $50 gift card. Alice.com has a ton of brand name mostly non-food grocery store items. You can buy Aquafresh toothpaste, Dial soap, Kleenex tissues, Glad trash bags, etc. They do have some food but mostly nonperishable stuff like tea or coffee. The prices are OK but not fabulous. But with 30% off it makes it a good deal. They also sell the Forever US postage stamps so this is a way to get 30% off postage stamps. Note: Alice.com only carries name brand items. You'll often get cheaper prices for purchases by buying store brand items or shopping sales. Buying through Alice.com is a convenient way to get decent prices on name brands (with free shipping) but its probably not the cheapest way to buy stuff in general. So if you really want to save the most then buy store brands, shop sales and/or use coupons. A couple weeks ago I caught an episode of the Suze Orman show and she gave her top signs of a bad financial advisor. I'd generally agree with all these in most cases. Rushing you is not good at all. Theres no reason you have to make a decision immediately. You should be able to think on things for a day or two without any worries and if they say otherwise then thats a bad sign. They should definitely be explaining fees and their commissions. Be wary of anyone who doesn't go into that or share that info when asked. I think there can be exceptions to #3 for sure. Say you've only got $50k to invest and they recommend you put it into a safe bank account cause you're saving for a house. Thats a good reason to put all your money in one place. Or maybe you're retiring and they suggest you put $100k into a fixed annuity. That isn't necessarily bad advice (depending on the terms of the annuity). For #4, If you're married or have someone else with a stake in your finances then the advisor should want to talk to all the parties. If they don't then that is generally a problem. But I wouldn't be so hard fast on this one. If a husband or wife seeks some advice without their spouse then I don't think the advisor should necessarily demand to talk to the other spouse. Lastly if an advisor doesn't ask you what you need then thats not a very good advisor. They can't meet your needs if they don't ask for your needs. Advice can be either good or bad depending on the situation. I wouldn't tell a 20 year old saving for retirement to put their money in a bank CD and I wouldn't tell a 70 year old on a fixed income to put their life savings in stock funds. Which Makes Better Rentals: Single Family Homes or Plexes? If you are planning to buy real estate as an investment then you can go two major ways with residential property. You can buy a single family home or you can buy a plex. A plex is a duplex, tri-plex, 4-plex or other larger multi-family property. There are pros and cons to doing single or multi family properties. Rent Income is diversified - If you have a vacancy in a mult-family unit then you aren't losing 100% of your rent over it. If you own a 4-plex and there is a vacancy in one unit then you're still getting 75% of your rent from the other 3 units. Its not very likely you'll have multiple vacancies at the same time very often. This helps smooth out your cash flow better. Generally better returns - It usually easier to make positive cash flow with a plex than a single family unit. If you look at rent / property cost, around here it seems I can get only 4-5% on a single family but could get 6-7% on a duplex. The profitability is a bit easier with mult-units. Easier to watch over - With a mult-family unit you have easier access and better reason to be at the unit checking up on things. With a single family unit you have only one tenant. To go to the rental you really need an excuse or reason to be there. If you show up all the time it may be irritating to the renters and to gain entry you need permission or have to give them notice. Plus with a multi-unit the tenants will tend to watch over one another. If a tenant is causing problems then another tenant will likely complain to you and you'll find out much quicker than you might with a single family unit. Fewer tenants = less work - This is probably the biggest one. With more tenants you will generally have to do more work and have more potential hassle. A single family unit only has 1 tenant but a plex has more tenants. More bills with multi units - With a single family unit you can usually have the tenant pay most if not all the utilities like water, garbage, sewer, etc. You'll often endup paying water and garbage on a plex and maybe some other bills. The landlord is often stuck paying some utilities since the service is not split up between the renters. Easier financing, insurance or regulations on single family- It can be harder to get financing on a mult-family unit than on a single family home. Insurance companies may jack up the rates on multi-family units since you have more risk due to more occupants. Zoning rules may be more of a hassle or cost you more money in various ways with a multi-unit property. Easier resale - A single family home has better demand and resale. There are plenty of people out there that want a home to live in but much fewer people who want to own a rental. Potentially less upkeep - You can often have a tenant in a single family unit handle basic upkeep of the unit like mowing the lawn or raking leaves. What is cancer insurance? Basically cancer insurance is insurance that covers treatment costs related to having cancer. It only covers cancer and doesn't cover other forms of illness or injury. Why not? Cancer insurance would be basically redundant to normal health insurance. If you already have health insurance then you don't really need cancer insurance because your health insurance will cover cancer treatment. If you don't have health insurance then you should get it instead of and before you get ailment specific insurance like cancer insurance. So the better solution is to get good health insurance. The state of Wisconsin has a page on cancer insurance. One thing it points out is that 7 out of 10 Americans will never get cancer. Everyone needs health insurance. Most of us won't need cancer insurance. If you get health insurance you'll be covered either way and since you really do need health insurance you should get it. I haven't always gone shopping on Black Friday but the past year or two I've gone with my wife. What has worked for us in the past couple years has been going to sales that most people don't go to. Last year we went to a local discount store and there wasn't much of any line and we easily got the one item we wanted. This year we're planning on going to a used book store. I doubt that the book store will be too busy with most people at the large name retailers. Overall we've had better success going to smaller less popular sales than we've had going to the big name stores. Generally it seems to get the real good sales at the big name retailers you have to get up before dawn and stand in line for hours and even then you only have a chance of getting their early enough to get one of the limited items. SO you can spend a lot of time, lose some sleep and still not get what you wanted. Your chances of success are better at less popular sales. I doubt there will be much if any line waiting to get into the used book store and we're not facing a limited number of a handful of door-buster sales items. So this is my tactic : Look for a sale with high value to you and low general interest. In other words find a sale where there is stuff you want to buy for a good price but its not a very popular store or not somewhere that people are likely to go on Black Friday. The used book store is a good example. We can get books for 50% off so that is a high value for us. However most people aren't even going to think of a used book store on Black Friday given all the giant sales at Best Buy or Walmart. Of course you'll have to judge for yourself where you'll get the best value. You might do better waiting in line 8 hours at Best Buy to save $250 on a TV than we'll do at the book store. We won't have to wait in line at the used book store but we won't save a ton of money there either. But the money we do save at the used book store is pretty guaranteed and easy money. I'll be busy this week with the holiday and family in town. So there will be limited posts this week. I added up the expected annual dividends on the holdings in my Roth IRA and based the current market value of the account the total dividend yield is about 3.6%. If I figure the current yield based on what I paid for the stocks is 5.8%. The account has gone up about 31% in the past year. As the current market price of an equity goes up the yield % rate gets lower. If you buy a stock at $10 with a $1 dividend then its yielding 10%, but if that stock then goes up to $20 the yield is now only 5%. Of course on the other hand if the stock goes down then the dividend yield goes up. Bad Money Advice explains how trading in foreign currencies (or Forex) isn't a good idea: Forex for Everybody? If I look around my house there are electronics plugged in everywhere. Off the top of my head we've got : 3 digital clocks, microwave oven, coffee maker, 4 phones and answering machine, toaster, 2-4 phone chargers, big screen TV, HD DVR, HD DVD player, Tivo, Wii, stereo amp, another stereo, 2 computers, 19" TV, DVD/VCR, internet modem, printer and a home security system. Some of those items are in pretty frequent use but others are only rarely used. Whether they are in use or not at any given time they are probably all using at least a small amount of power. Virtually all modern electronics have some power draw in standby mode. That standby mode power usage of your electronics is costing you money around the clock. The exact usage of each device will vary. You'd have to actually measure your own devices or check their specifications for a standby power rating to find out exactly how much power your electronics are sucking while off. For reference a I found a Lawrence Berkeley National Laboratory page that has some data on standby power consumption of typical home electronics. Of course some of these you'd likely be using some of the time. But even if you used them 8 hours a day then you'd be off 2/3 of the time. So your cable set top box may be costing you $10 a year in electricity while its off. What to do about it? Simple answer is to unplug stuff but there are other ways. Unplug items when not in use - Simply unplug the item when they are not being used. This is pretty straight forward and will work just fine for many items. But it can be a bit of a hassle to unplug something everytime you turn it off and its likely you could forget to do so. Use a power strip with on/off switch - If you have a computer setup with a computer, printer, speakers, etc. then you can plug all the items into a power strip and then power down the power strip. Rather than having to unplug each device individually you can just hit a single switch. This is easier than unplugging everything but you could still forget. Use a Smart Power Strip - Over a year ago I talked about how I had bought a Smart Power Strip and figured I was saving about $18 a year with it. A Smart Power Strip will automatically turn off power to your accessory devices when you shut off a primary device. So for example you can set it up with your computer so that when you turn off your computer the strip will automatically also then power off your printer, speakers, etc. This one is a good solution since you can't forget to turn off your accessories since its automatic. - This is a combination of AC socket adapters and a remote control switch. You plug the AC adapter into the wall then plug your electronics into the adapter. You can then turn the AC outlet on/off via a remote. This is handy for items like your TV entertainment center or other items where you might want easy access to the on/off for the power. While its very convenient its not automatic so you might forget to turn off your devices. Most of us have the option of picking a High Deductible Health Plan (HDHP) insurance plan with a health savings account (HSA). But it can be difficult to decide if an HSA plan is the right choice. You're often faced with confusing jumble of deductibles, premiums, co-insurance rates and out of pocket maximums. One way to figure if an HDHP with HSA or a traditional premium health insurance is your better option is to compare the minimum and maximum annual costs. Your minimum costs would be what you pay for the monthly premium plus any known costs you may have. If you have no existing health conditions then your minimums may be nothing more than the monthly premiums. But many of us have some sort of minor or major ongoing health condition which has some known ongoing costs. Lets compare an example traditional plan and a HDHP/HSA plan. Start with your monthly premiums. These should be stated in your plan literature. Then add any minimum known costs. Say for example that you take a prescription for an existing ailment which costs $50 per month. With the HSA this cost would be out of pocket but it for the traditional plan you may only pay a $10 co-pay. However for the HSA one detail is that the cost is coming out of pre-tax dollars so to figure your after tax rate you multiply by 1 - marginal tax rate. So in other words if you are in the 25% tax bracket then you would multiply your cost by 1 - .25 = .75. This is because you're really paying with pre-tax dollars so to compare that with after tax dollars you'd take out the tax equivalent amount. The maximum costs could be more tricky to figure or might be pretty easy. If your plan documents a 'maximum out of pocket' cost then that is your maximum costs. Otherwise you can figure your maximum costs by adding your premiums, deductibles and any co-insurance up to its stated maximum. Maximum costs = Your monthly premiums + deductible + maximum co-insurance -OR - your stated maximum out of pocket costs. For the HSA it may have a documented 'maximum out of pocket' limit. That gives you a straight forward maximum cost for the plan. Again your HSA funds are pre tax dollars so you could figure your after tax rate by applying your marginal taxes to it. In this example the HSA is the cheaper option for both the minimum and maximum cases. Since the HSA wins in both cases its the better option. It seems that this is the time of year that people do the open enrollments for health benefits at work. Health Savings Accounts (HSA) are fairly new and it seems more and more people are signing looking into up for them. I've been using an HSA for a couple years now and I think it is a great option. Whether or not it is your best choice depends on the other options and your own situation. I think one reason people may be hesitant to get an HSA is over confusion about how they work. Since HSA's are new to people it may not be obvious how they work in comparison to traditional health insurance. My friend was looking at an HSA but he was unsure about who billed who or what he paid and when he paid it. I've been using an HSA for a while so I know from my own experience how it works. I figured it might be helpful to go through the process of billing and explain the actual logistics of paying with an HSA. I'm using example numbers below and your actual numbers will vary. For my HSA I get to decide how much money I want to put into the HSA. The money comes out of my pay check pre-taxes. That is an important detail since it means I'm not paying any taxes on the HSA money and it reduces my taxable income. The money goes straight into the HSA account right out of my paycheck. The HSA account is very similar to an IRA account. I have control over the HSA money myself and I can write checks out of it or use a debit card to make withdrawals. The funds in your HSA do not expire at the end of the year and can be used later in life. The HSA funds are yours for good and can be transported to a new job or used in retirement. This is generally how it works for me with my HSA. 1. I go to the doctor and get needed care. 2. I don't pay anything at the doctor office. They just bill me later. 3. I get a notice in the mail that the charge from the doctor was say $200 and that they've also billed my insurance. I don't pay yet, but instead I wait to hear what the insurance company says. 4. Next my health insurance company responds to the doctor and says the negotiated rate is $100. I then get an adjusted bill for the $100. 5. I pay the doctor $100 using my HSA funds. It works like that until I hit the deductible. Before you meet the deductible you're responsible for paying all the costs. The insurance company tracks how much I've paid. You should also statements showing how much you've used and what you've paid. Then after the deductible I pay just 10% of the costs. After the deductible is met the process basically works the same but I only pay 10% of the costs and the insurance pays the other 90%. So for example after I have paid the deductible I get an ear infection and I go to the urgent care clinic. They treat me and send me home, I get a bill in the mail for $150. Then insurance responds and says they'll pay $100. Insurance pays $90 and then I'm told that I'm responsible for the other $10. I then use my HSA to pay the remaining $10 to the clinic. What if you owe more on a bill than is in your HSA? You can pay the bill with your own money and then reimburse yourself later with the HSA. Here is an example: Say its the start of the year and and you just signed up for an HSA this year and you've only had $250 pulled out of your paychecks. Then you appendicitis and need to go to the hospital. You end up with a hospital bill of $3000. You are required to pay the first $2400 of that to cover the deductible and then the next $60 which is 10% of the remaining $600. So you owe $2,460 today. However theres only $250 in your HSA. You can pay the $2460 out of pocket right now and then pay yourself back later using your HSA. So you use the $250 out of the HSA to drain it to $0, write a check out of your own cash for $2,210 today. Then 6 months later your HSA is back up to $2500 so you write yourself a check out of the HSA for the $2,210 to reimburse yourself. With bills going back and forth its not hart to lose track and pay an incorrect amount. I've ran into situations where I over pay and then the insurance company refunds the money. We don't even always know if we've overpaid until a check from the insurance company shows up. If you want more information on HSAs then check out the Treasury Departments page on HSAs. They have a ton of information thre with FAQs and guides. Yesterday I gave a bunch of reasons Why You Should NOT Invest in Real Estate. I was purposefully trying to scare away the weak of heart. But that was more of a worst case scenario and most of that stuff won't happen or at least won't turn out as bad as that. There are a lot of good sides to owning rental real estate. Today I'll be more optimistic and point out all the great reasons why you SHOULD invest in real estate. Monthly income - If you get the right property with the rents higher then the expenses then you should see a positive cash flow. You can even do this with a relatively low initial investment and get a higher monthly return for your money than other investments. For example a $10,000 down payment on a duplex might give you a $2,000 annual income for a 20% return. Long term appreciation - In the long run real estate appreciates. Even though we've seen the real estate market go down lately, in the long run real estate has grown over the years. Renters pay off your mortgage - With a loan you can buy a property with just the down payment and then the rent will pay your mortgage. Then over the years the mortgage will gradually be paid off until 30 years later you own the property free and clear. Tax benefits - Everything you spend on the rental is a potential tax deduction. If you have a mortgage then the mortgage interest is a tax deduction. This helps offset rental income. Another big tax deduction is the depreciation. You can deduct about 1/27.5 of the value of the property as depreciation. Combining mortgage interest, other costs and depreciation it isn't hard to see a profit turn into a tax loss. Tax deferral on gains - You generally don't have to pay taxes on your gains until you sell, even then you can potentially defer those gains. As your equity grows in a property you have no immediate tax bill due. You could potentially accumulate value in your rentals and never pay taxes if you don't sell them. Even if you do sell a unit and buy another rental you can use a 1031 exchange to defer the taxes. Stable business - No matter what happens people will need a place to live. Demand for rental units may go up and down but the market will not die out due to some new technological innovation or things like off shoring. You can count on rentals being a viable business well into the future. You are the Boss - When you own real estate you are in charge of the investment. This is good for a couple reasons. First you get to run things they way you want to. So you have the flexibility get to dictate how things work to suit your own preferences. Second you aren't dependent on someone else to do a good job. You don't have to rely on a the success of individual financial managers or hope that Wall Streets actions will fall in your best interests. Emergency housing - Worst case if you lost your home for some reason you could move into your rental property. It could be a fall back housing option. You could also use your rental property as emergency housing for people you love. For example if your parent or sibling had extreme financial difficulty then you might be able to subsidize them by allowing them to live in your rental property either free of charge or for a reduced rent. For about a month and a half now my wife and I have been pumping money into one of our rentals. The tenants moved out without notice and we're having to fix up a few things and a couple more things and then even more things. The bills seem to just keep adding up. This has been a unenjoyable reminder of how some of the negatives of owning rentals. There are many good reasons to own rental real estate, but there are also many reasons why its not a fun investment and there are some substantial risks. For a worst case scenario of how bad a tenant can be you could watch the movie Pacific Heights. Of course thats just fictional drama but its not outside the realm of possibility. Unless you're the luckiest person in the world most landlords will run into some problems and you need to be prepared for them before they happen. Below I list some of the negative sides of owning rentals. Mortgage obligations - If you have a mortgage on your property then you'll have to pay that mortgage. Generally your rent will cover that mortgage, but what if there is no rent? In a worst case scenario you may be in a situation where you have no rental income coming in but you'll still have to pay that mortgage. Unexpected repairs and maintenance - You might luck out and have very low maintenance and repair bills. But you might have bad luck and your property might start falling apart soon after you buy it. Big bills can add up... What if the furnace breaks down? Thats $500 for repairs. What if termites infest the home? That will be $400 for exterminator. What if a hail storm damages the roof? Your $1000 insurance deductible comes out of your pocket. What if you're really unlucky and all 3 of these things happen in the first year? All the sudden you're paying a $1,900 loss. This isn't even a high bill. Electric problems, plumbing problems or a dead HVAC system could cost you $2000 or more pretty easy. Difficult tenants - Most tenants are great but some are not. Some tenants can be a giant pain in your rear end. Tenants might break your lease terms and lie to you about it. You might smell cigarette smoke and hear a barking dog coming from their unit which you don't allow pets or smoking in but they'll insist that it isn't them. They might harass or annoy you over trivial things. You could get phone calls at 1am in the morning because they are drunk and locked themselves out of their home. Tenants who do not pay rent - Most tenants pay rent on time but some don't. Inevitably you will have tenants who are unable to pay their rent for some reason or another. Usually they have a legitimate reason for not having the rent like loss of a job or other personal problems. But sometimes your tenants have no good excuse other than they 'blew' the money elsewhere. They might try and get you to let them owe you for a week and that week might turn into two weeks then a month. If you allow this then before you know it your renter is 2 months behind in their rent. Having to evict a tenant - Actually having to physically evict a tenant is not very common assuming you do a decent job of selecting tenants in the first place. But for one reason or another you might eventually get one of those tenants who simply won't leave and tries to work the system in their favor. If you do have to evict a tenant then you might take a couple months or more figuring out the system, dealing with the lawyers, courts and eventually the sheriff who will normally physically remove the tenant in the end. The actual legal eviction process can be a giant hassle and expense for a landlord. Criminals - No matter how well you screen tenants you might end up with a criminal. Criminal activity by tenants could cost you a significant amount. If tenants set up a meth lab in your rental property then having the property cleaned up could run several thousand dollars. (this is one of my dads major fears as a landlord) Or worse yet a renter could be violent and pose a physical safety risk to the other tenants or yourself. Protracted vacancies - Just cause you have a home to rent doesn't mean anyone will want to rent it. Its not always easy to find good renters so its possible to have a unit sit vacant for a month or two. If an area is hit hard by some economic problems then people might move out of town and rentals might sit vacant for a long time. Legal liability - One of the worst case scenarios is if a tenant suffers some sort of physical injury and sues you as the landlord for damages. Lawsuits aren't really as common as people seem to think but they do happen. You need to worry about legal liability and make sure you aren't legally negligent in any safety hazards on the property. Renter damage - When a tenant moves out you'll be lucky if they clean the place and leave it in the condition it was when they moved in. Often tenants won't bother to clean and its common that they'll have left some damage. Sometimes the amount of damage is more than the security deposit. If you don't think tentants could do much damage then think harder. Tenants might drag their car battery into your home and spill battery acid all over the carpet. You could rent to this guy who left a giant pile of trash in the apartment. Most of the above is not stuff that you're likely to see. Most tenants are not criminals who will skip out on several months worth of rent leaving the apartment trashed. But there is a risk that anything above could happen. You might get unlucky as a landlord. If you never want to take the risk of any of the above problems happening then you should probably not be a landlord. If you are a landlord or are considering buying a rental then you could avoid most of the problems above by being very careful and picky about who you rent to. Otherwise you can mitigate these risks for planning and budgeting for some problems in advance. Wise Bread discusses The Pros and Cons of Retail Health Clinics Such clinics seem like they might be a practical and cost effective idea for minor health issues. A while ago I talked about some potential investments that I was looking at buying. One of the investments was an oil trust. At the time I didn't go into much depth about how investing in an oil trust works or how you might go about picking such a trust to buy. Today I'll cover those topics. But first, what is an oil trust? Wikipedia has a page on oil trusts that discusses them at some length. Or you can refer to investopedia's definition. But in short: an oil trust is a financial company that owns the rights to oil or natural gas in the ground and then gets paid for oil produced from their property, the payments are then distributed to share holders in the trust. An oil trust is a good way for an individual to invest directly in oil or natural gas. Oil trusts may own oil and / or natural gas. Most of them own both oil and gas. Why invest in an oil trust? The key benefits of an oil trust is that you get a high dividend payout and you can profit from an increase in the price of oil. Investing in an oil trust is a hedge against energy prices as well as a direct investment in energy commodity. How do you value them? To determine which royalty trust is a 'good' buy you have to know how to value them. Determining what the value is of a royalty trust is very different than valuation of a normal stock. When you buy a normal company stock you buy a business that makes stuff or sells a service. So with a normal company you can look at their income and debt and growth and earnings all as indicators of the health of the company. Royalty trusts are very different, they don't have employees or debts and their production is almost pure profit. But they are a depleting asset which means they are selling something that will eventually run out. The return on a royalty trust will depend on two key things : 1) the market value of the asset and 2) the amount of asset they own. Therefore its my opinion that you should be able to value a royalty trust primarily based on the current market value of their assets. In otherwords if you figure out how much oil or gas they have and find its current market value then that is the value of the trust. So lets look at a few trusts and compare them. I gave links to their website and annual reports if I could find them. For each of the trusts I found their current dividend yield, price, 5 year dividend average, market cap and I attempted to calculate the present cash value of their oil & gas reserves. To find the reserves I had to search through their annual reports so for these cases I'm looking at the reserves at the end of 2008 which is the most recent data. For the current market values I used the current oil price of $79 per barrel from Bloomberg and $4.46 per cfm for natural gas. Those are volatile numbers that go up and down every day. The yields are a current snap shot based on the most recent dividend. Yields for trusts bounce up and down based on market conditions. So if oil goes up then the yield goes up. In the table below I give the stock symbol for each trust, its current dividend yield, the 5 year average yield and the right column is the cash value of proven reserves / market cap (R / M). I couldn't find enough info on MTR so I may as well cross that off the list. It seems that the reserves of SJT are lower than their market cap. BPT and HGT are the two that stand out as the best overall. They both have high reserves relative to market cap and they both have double digit 5 year average yields. If I'm to pick a winner from this analysis then BPT would be my choice as they have highest yields and very large reserves. I only reviewed a few royalty trusts here because these were the ones I was able to find first. The Wikipedia page has a longer list and I may do the research on all of those royalty trusts as well. A couple more important points about oil trusts. Taxes on royalty trusts could get pretty complicated. The dividends are taxed as normal income but they may be treated as a depleting resource so you get to deduct that. Normally you'd have to file a schedule E for the costs and depletion deductions and a schedule B for the dividend income. This guide from CrossTimbers Royalty Trust discusses taxes and calculation of depletion. It might be a good idea to consult a tax professional and have them figure this if the dividends are taxable. If the royalty trust is in a retirement account then you don't have to do the paperwork. It all depends on the price of oil & gas. This may go without saying but investment in an oil trust is completely dependent on the market price of oil & natural gas. If you buy an oil trust you're betting that oil or gas will at least retain its value or hopefully go up in the future. This seems like a safe bet to me. Right now in my wallet I've got 4 credit cards. I have my Amex card via Costco that I use for most everything to get the rewards, I have a Citibank Mastercard that is my backup for places that don't take Amex, plus I also have another Mastercard and a Discovercard that I don't really use. I also have 3 different debit cards. Hmm, I carry too many cards don't I? How many credit cards do we have? This report on the Federal Reserve site from 2007 says that we had 4.6 credit cards per person. Almost 5 credit cards per person. The statistics page on Creditcards.com says that "In the fourth quarter of 2008 ... Overall, consumers had an average of 5.4 cards" and they cite Experian as the source. From Census data in 2006 there were 1,488 million credit cards total in the country and the Census also said there were 114 million households in 2006. That works out to 13 credit cards per household. But that number also includes "Universal Air Travel Plan (UATP), phone cards, automobile rental, and miscellaneous cards" If you exclude those then you get a number of about 10.5 cards per household. Levis online is having a sale of 40% off their 'favorite' jeans online prices. Plus you also get free shipping. But the sale is for today only! My preferred style of Levi's jeans are $21 onsale with free shipping and they normally run $30-$50 retail. Exclusive 40% off our favorite jeans. 1 Day Only! Ends at 11/12/09 at 11:59 am EST. Offer valid through 11:59 AM ET 11/12/09. Offer valid on select men's & women's products only. To participate, simply add the qualifying products to your shopping cart and a 40% discount will be applied to those items. Applies to levi.com only. Entire order must be shipped to a single address. Customer responsible for all shipping costs for returned merchandise. This promotional offer may be modified or terminated at any time without notice. I heard about this one on Fatwallet.